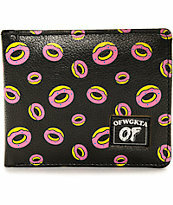 If you're looking for ample storage and OFWGKTA style, look no further than the Donut black backpack from Odd Future. This black colorway features the signature pink frosted donut logo printed throughout and lined with a donut print fabric as well. This comfy backpack features a ton of storage options with three storage compartments, a laptop sleeve, and a front organizer pouch pocket. 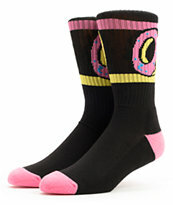 All over donut print backpack from Odd Future. Large zipper compartment with donut print lining. Small front zip pocket with donut zipper pull. 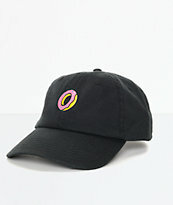 Odd Future logo detailing throughout. Padded mesh back panel and shoulder straps. 18' x 15' x 5'.